Harvey has left a trail of destruction that starts along the Gulf Coast of Texas and Louisiana and extends as far as the country's northern border. Whether left stranded, worried about family members living in its path or working on relief efforts, Minnesotans have been wrapped up in the deadly storm's aftermath. For Linda Koelman of Minneapolis, the storm meant a canceled cruise and several days stranded at an ocean front hotel in Galveston, Texas. As she looked out her hotel window, she said the storm left her with a sense of helplessness. "You're just kind of stuck and you don't know anything," said Koelman, a pastor and police chaplain. "It's a scary feeling." She and her family could finally get out of Galveston Wednesday morning. On the road toward Dallas, Koelman could see evidence of the hurricane's historic rainfall — more than four feet in some locations. Images of flooding and wind damage have brought a response from Minnesota residents. The Red Cross has sent nearly 30 volunteers from Minnesota to the Gulf Coast. Target is donating $500,000 to the relief effort. Cargill is giving $100,000. There have also been smaller-scale efforts, too. Minneapolis resident Sishir Chang grew up in Houston. He still considers himself a Texan and wants to help, so he hopes to fill a 12-foot trailer with supplies and drive it south. "What I'm planning to do is putting together a collection of items, primarily toiletries, to take down to a shelter," Chang said. Chang has helped with relief efforts in the past, like hurricanes Ike and Katrina. He plans to look for other ways to help the region after that first trailer load is delivered. The Animal Humane Society in Minnesota will send volunteers to the Gulf Coast to work at animal shelters. Many pets were separated from their owners in the storm, said Zach Nugent of the Humane Society. His team will partner with a Houston animal rescue, he said, "doing a lot of triaging and supporting that shelter." The group will also bring some of the animals in the shelters north to Minnesota and neighboring states. These are mainly pets that were in the shelters before the hurricane hit. 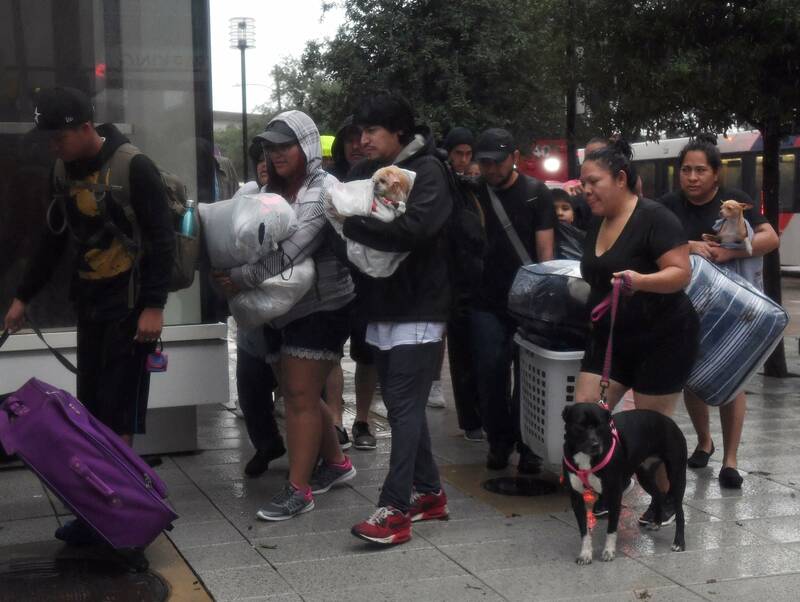 By moving them, the Texas animal groups will have more room for the storm separated pets they hope to eventually reunite with their owners. Alex Broughton, a Minnesota native who lives in Houston, said residents will appreciate all the relief efforts. He came through the storm in good shape — his town home never even lost power. But Broughton said there were long hours of worry for his family about tornado warnings and possible flooding. Conditions are improving where he lives, though, and he said he's been able to get out and buy supplies. "People were glad to see other people in the grocery store," Broughton said. "We've been pretty isolated to our own homes and families. So just to see everybody and share our stories brought us back to a little bit of reality." He hopes to take another step back toward normal living this week with a trip out of Texas. It's a tradition for his family to take their annual trip to the Minnesota State Fair. Correction (Aug. 31, 2017): Sishir Chang's name was misspelled in an earlier version of this story. The article has been updated.